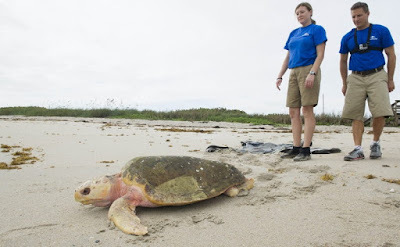 BREVARD COUNTY, Florida – The SeaWorld Orlando Animal Rescue Team returned a 128-pound loggerhead sea turtle measuring 30.4 inches long to the Canaveral National Seashore’s Playalinda Beach in Florida. The large sea turtle – which took three people to carry – energetically crawled into the ocean waves once placed on the sand. The sea turtle was rescued in Cape Canaveral, Florida on March 12, 2015 after being discovered beached, emaciated, lethargic and covered in barnacles. The sea turtle was retrieved by a Florida Fish and Wildlife Conservation Commission Ranger and taken to SeaWorld in Orlando, Florida for treatment. During the course of the 8-month rehabilitation, the sea turtle gained 24 pounds. As part of treatment, the turtle received a balanced diet, increased vitamin intake, and daily care by SeaWorld Orlando’s veterinary and zoological staff. After a positive trend in health and several medical tests, the turtle was deemed ready to be returned to the ocean by government officials. SeaWorld Orlando veterinarians and zoological staff work closely with the Florida Fish and Wildlife Conservation Commission to determine when and where a rescued animal can be returned.